Genuine tan leather, part down/feather filled backrest cushions, rosewood stained timber legs. H:74cm Seat H:42cm W:200cm D:78cm. Excellent, normal patina to leather. 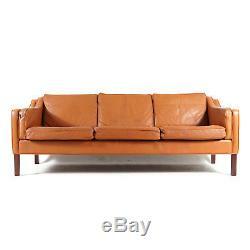 Beautiful sofa in a stunning full grain leather with superb patina. Excellent quality, made in Denmark. We reserve the right to re-list the item/s if terms are not adhered to. Collection & Viewing: Collection can be made from our Bristol warehouse and viewings can be arranged by appointment only. Please accept by purchasing vintage items, this means that most items will show some signs of age related wear and previous use, anything beyond this will be detailed or pictured in our listings. We can assure you that every items condition will be described to the best of our teams ability. The item "Retro Vintage Danish Rosewood & Leather 3 Seat Seater Sofa 60s Mid Century 1970s" is in sale since Thursday, November 8, 2018. This item is in the category "Home, Furniture & DIY\Furniture\Sofas, Armchairs & Suites\Sofas". The seller is "modernistiks" and is located in Bristol. This item can be shipped worldwide.